To get started, click on this link. You will be taken straight to the signup page. 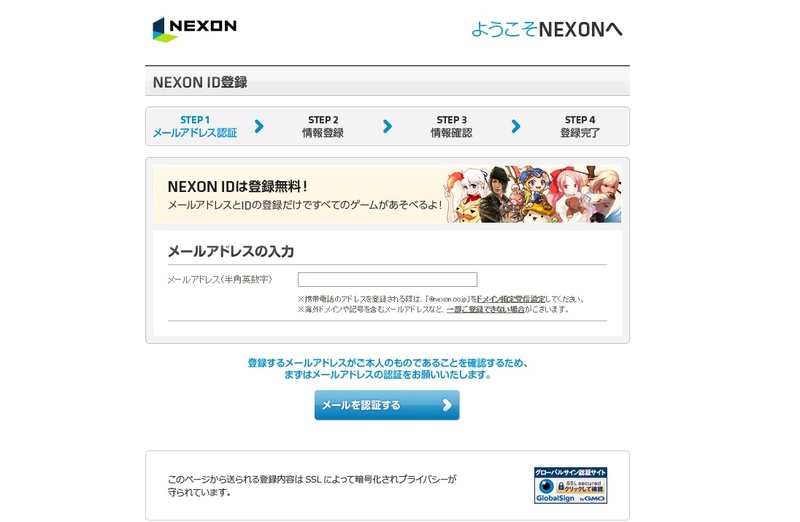 Next, you will get a confirmation from Nexon Japan to verify your email address. Head on over to your respective provider and locate the email (for some, the email may end up in the junk mail). You will get an email that looks similar to the screenshot below. Click on the link you are provided to proceed with the signup. After clicking your verification link, you will be taken to the page similar to the one in the screenshot below. You must fill in the three blanks to continue. The first blank is the Nexon ID (the username you will log in with from now on), and the blanks below are the “Password” and “Password Confirmation” boxes respectively. The box to the right of the password is simply a password guide. The password must be written using English characters, between 6-20 characters long and it cannot be identical to your Nexon ID.And remember, NEVER give out your password to anyone! In addition, there is a checkbox near the bottom of the screenshot. You are given the option to receive newsletters from Nexon to your email (you will get emailed once or twice per month), but you can opt out of this by unchecking the box. If you wish to enhance your gaming experience at Nexon, consider purchasing Nexon Coupons from Japan Codes by clicking here.Each Nexon game has various perks which you can purchase using Nexon Points. What are you waiting for? Get your game on today!